SUBSCRIBE TO THE EVYLTYDE FAN CLUB AND GET HEAPS OF COOL STUFF!!! That's right! For only £5 a month (£6 pcm for our overseas friends) you can subscribe to the Evyltyde Fan Club and not only help support your favourite band, but get heaps of cool stuff as well! FREE ENTRY AND BACKSTAGE ACCESS TO ALL EVYLTYDE HEADLINE SHOWS! Come to one show, come to a few, come to them all. If we're heading the bill then you get on the guestlist with an AAA Pass so you can come hang out with us backstage, plus we'll be offering discounted entry/tickets to all our Fan Club subscribers for our shows supporting other artists or at bigger events. You'll get a log in and password to access a members only website that will have special previews, free downloads and all sorts of stuff just for you! 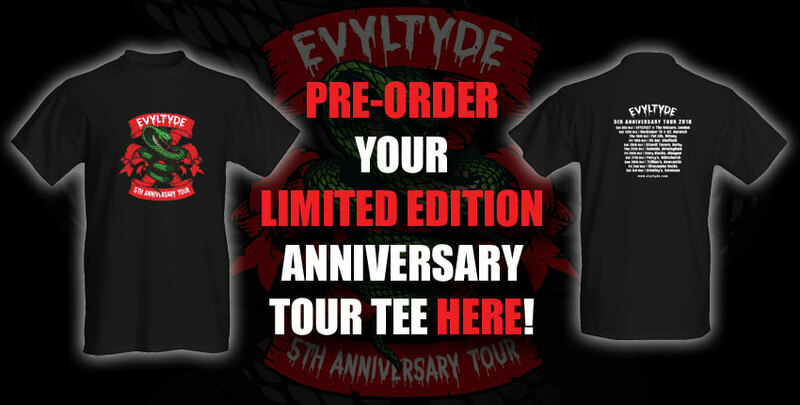 Every quarter (that's 3 months by the way) you'll get new Evyltyde merchandise including tees, hoodies, beanies, wristbands and whatever other crazy stuff we can come up with PLUS ALL of our future music releases either as a digital download or on CD posted to you as part of your subscription! Yes, you read it right! We are going old-skool and will be putting out a PRINTED fanzine every 3 months that will come with your new goodies. With the world going more digital every day and everything becoming more instant it's going to be harder to be able to 'look back' at things that only ever happened online. So what better way to combat this modern onslaught than by offering you, our fans, a real physical fanzine that you can keep for years to come. Something that you can look back on and even show your children and grandchildren - and who knows, one day it might be worth something! There are terms & conditions (isn't there always! ), so please make sure you read them before you subscribe. AND ACCESS TO FREE MUSIC!